5049 C Valley View Blvd. Our goal is to provide you with quality, advanced dental care. That's why each of our offices is equipped with state-of-the-art technology. Our doctors and staff are highly trained, reputable, and caring professionals with the tools, techniques, and commitment to make your experience a positive one! When you visit an office of Blue Ridge Dental Group, your smile is our top priority. Our entire team is dedicated to providing you with the personalized, gentle care that you deserve. Part of our commitment to serving our patients includes providing information that helps them to make more informed decisions about their oral health needs. This website is a resource we hope you’ll find both useful and interesting. We want to see you smile! Feel free to contact one of our locations today! We genuinely hope this site is helpful to you in learning more about our practice, dental conditions and treatments, dental recommendations, and more. Please browse through our website and be sure to give us a call if you have any questions or would like to schedule an appointment. At each Blue Ridge Dental Group location you will find friendly, professional doctors, a full range of dental services, including cosmetic and general dentistry, hygiene, oral surgery, teeth whitening, fillings, crowns, and bridges, and the latest in dental technology. Our locations provides many different general and cosmetic dentistry procedures and treatments, including: Laser Dentistry, Zoom2! Chairside Whitening, Porcelain Veneers, Dental Bonding, White Fillings, Dental Implants, Dental Crowns, Porcelain Onlays, and Bridges. We also offer the latest in dental technology including Zoom! Whitening, Cerec restoration, Invisalign, and Periolase non-surgical laser periodontal treatments. Services offered vary from office to office. Please view the location nearest you for more information. 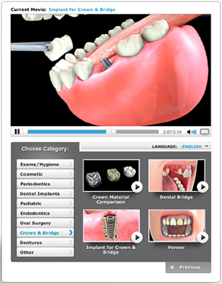 Blue Ridge Dental Group has provided this website for informational purposes only. Please contact one of our office for more information about our dentists or our dental services. We gladly welcome patients in the Salem, Roanoke, Christiansburg, Blacksburg, Bedford, Franklin County, Pulaski, Dublin, Floyd, Wytheville, Radford, Hardy, Vinton, Moneta, West Lake, Rocky Mount, Botetourt County, and Lynchburg, Virginia areas. Virginia Dentists at Blue Ridge Dental Group are dedicated to cosmetic dentistry such as Dental Implants, Porcelain Veneers, Invisalign and more.